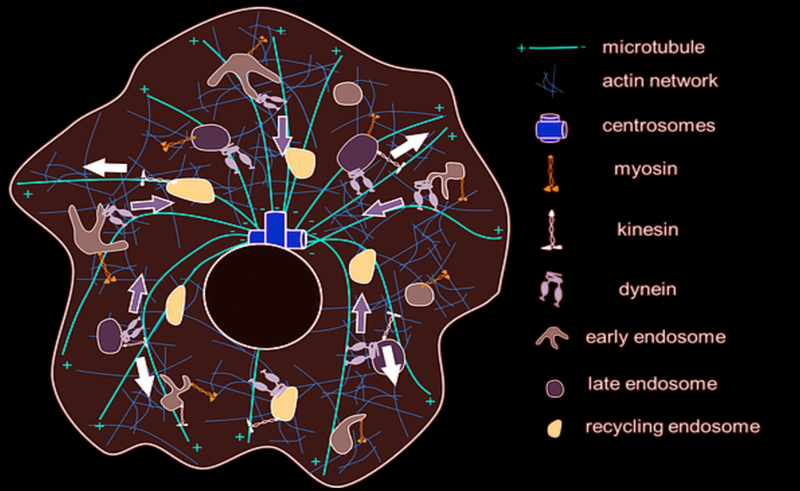 Figure: An overview of the known organisational details of membranous endosomes, cytoskeletons and the motor proteins in a single cell. A living cell is an active dynamic system where all the non-living constituents of a cell organize themselves through a complex set of interactions, integration of physical principles that gives rise to a ‘living’ cell. Within a living single cell, there are millions of interactions going on between tens of thousands of components. One central component of cellular life is vesicular traffic on the cytoskeleton network inside the cells. Quite analogous to how a city is organized with general public transport systems consisting of buses, light rails, and trains, specific highways for long distance transport, cars, motor bikes etc. the inside of the cells have self-assembled, polymerized proteins building up the tracks, membrane vesicles that carry specific cargoes building up the transport carriers, and the motor proteins that generate the force to pull the membrane vesicles to move along the tracks building up the transport system. This transport system is not only a dynamic system in itself but has also evolved constantly under tussle with pathogenic organisms. Many pathogens have evolved to ‘hijack’ this system as part of their pathogenic mechanisms while eukaryotic cells have evolved mechanisms to counter pathogens. The same organizational principles operate for the native cellular cargoes as well. Epidermal growth factor receptors, which are mis-trafficked in cancer cells, for e.g., operate under a strict recycling route under no-activation and travel to lysosomes upon stimulation with growth factors. The endosomes in such a system emerge as a signal regulatory platform, capable of controlling the duration, delay and amplitude of receptor mediated signalling. Therefore, cargos like viruses, growth factors and toxins are transported from the extracellular milieu to their intracellular destination to regulate cell decisions. They represent an ideal system to reveal the molecular code of trafficking mediated by membrane, motor proteins, and other regulators, using unbiased and global approaches. Understanding the principles of transport organization inside the cells offer high potentials for therapeutic interventions as well is a challenging unanswered question in fundamental biology. The basic questions that we ask in my lab is – 1. Can we break the code of intracellular trafficking inside living cells? 2. Can we design strategies to control, manipulate and reroute intracellular cargoes? 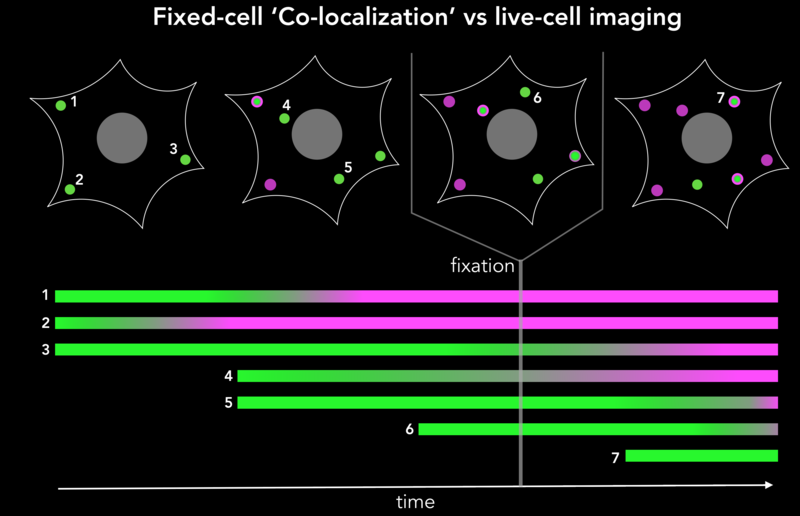 The ability to rise to the challenge of studying this complex transport systems at single cell levels derives out of my expertise in biological physics and lattice light-sheet microscopy (Betzig lab, Chen et al. Science, 2013) coupled with advanced analysis routines complemented with modern biological tools including optogenetics, gene-editing technologies. Figure: Lattice light-sheet microscope in the lab (left), imaging geometry (top right) with respect to the excitation objective (EO) and the collection objective (CO) and a cross-section of lattice light-sheet generated by intererence of multiple Bessel beams (bottom right). Fast volumetric imaging techniques are appropriate to measure stochastic processes like endosomal trafficking, conversions etc. The experiments allow measuring and tracking each and every endosome at whole cell level, facilitating unprecedented parametrization of the processes. We envision our studies to lead to precise mathematical modelling of these processes. We are interested in studying how different receptor systems, viruses, toxins and other cargoes are trafficked and we envision discovering the overall organizational principles of intracellular transport by imaging based discovery of various mechanisms and precise quantification of parameters leading to mathematical modelling. Movie. Shigatoxin containing vesicles inside a cell stained for actin. The lipids of the early endosomes: Making multi-modality work. Senthil Arumugam and Amandeep kaur, Chembiochem, April 4, doi: 10.1002/cbic.201700046 (2017). Quantum dot-loaded monofunctionalized DNA icosahedra for single-particle tracking of endocytic pathways. Endophilin-A2 functions in membrane scission in clathrin-independent endocytosis. Henri-François Renard, Mijo Simunovic, Joël Lemière, Emmanuel Boucrot, Maria-Daniela Garcia-Castillo, Senthil Arumugam, Valérie Chambon, Christophe Lamaze, Christian Wunder, Anne Kenworthy, Anne Schmidt, Harvey McMahon, Cécile Sykes, Patricia Bassereau and Ludger Johannes. Galectin-3 drives glycosphingolipid-dependent biogenesis of clathrin independent carriers. Senthil will be attending The Hunter Cell Biology Meeting. Manuscript in collaboration with Prof. Maiti, TIFR Mumbai, published in ACS Chemical Neuroscience. Our first pre-print from the lab is on BioRxiv.